It's early in the morning and the docks are quiet. The sun is rising over Buzzards Bay, setting the stage for another warm August day. As I walk around the docks, coffee (and camera) in hand, the shimmer on the water captivates me, much like it does most mornings since moving to the coast almost 10 years ago. While the harbor is still full of boats, many are already long out to sea in search of their daily catch. Located in southeastern Massachusetts just an hour south of Boston, New Bedford (also known as "The Whaling City"), is a bit of a hidden gem to those outside the region. During the 19th century, the New Bedford harbor was one of the most famous, and important fishing ports in the world, a fact that still holds true today. It's deep harbor allowed seagoing vessels easy access to its docks, something its then counterpart Nantucket could not, making it an ideal spot for fisherman and shipbuilders alike. During its peak, New Bedford sent out more whaling ships than all other ports combined. While it's no secret that the seafood industry plays an important role in New England's long history, this is especially true for New Bedford. The port here acts as a major seafood hub for all of New England, thanks in large part to the fact that its harbor is blessed with an abundance of fish, especially sea scallops, all of which are an easy day trip out to get. In fact, nearly 50 million pounds of sea scallops come into these docks each year, making them a much sought-after item on menus and at fish markets everywhere. While scallops (and seafood) can be found in abundance here, the region is also strongly influenced by the Portuguese immigrants who crossed the Atlantic to settle here. Local ingredients like chouriço and linguiça (Portuguese sausages) are equally as prevalent on menus, adding their own unique flavor to many New England-style dishes. But that's not all you can find here. Head up from the docks to Purchase St. and you'll find two of my favorite eateries - The Pour Farm, a small brew pub that serves more than 24 beers on tap (which are constantly updated in real time via the TapHunter app) and is home to one of the best cubano sandwiches outside of Miami; and No Problemo, a small Mexican eatery that offers reasonably priced, authentic dishes from burritos to quesadillas. Down the street a bit, you'll find one of the best hidden gems of all - Travessia Urban Winery. This small, downtown shop is owned by Marco Montez, who specializes in making small batch wines with primarily Massachusetts-grown grapes. The winery offers daily tastings, and the pinot noir rosé is sure to find an instant place in your wine fridge, making it a must-stop when visiting New Bedford. Also not to miss is Brick Pizzeria for colossal calzones, The Green Bean for coffee, Calico for shopping, and Be Jeweled. Island, making for an easy, no-hustle excursion to both islands. The historic downtown district lined with cobblestones streets, gives this city an outward charm unique to the region, while its maritime history gives it its pride. 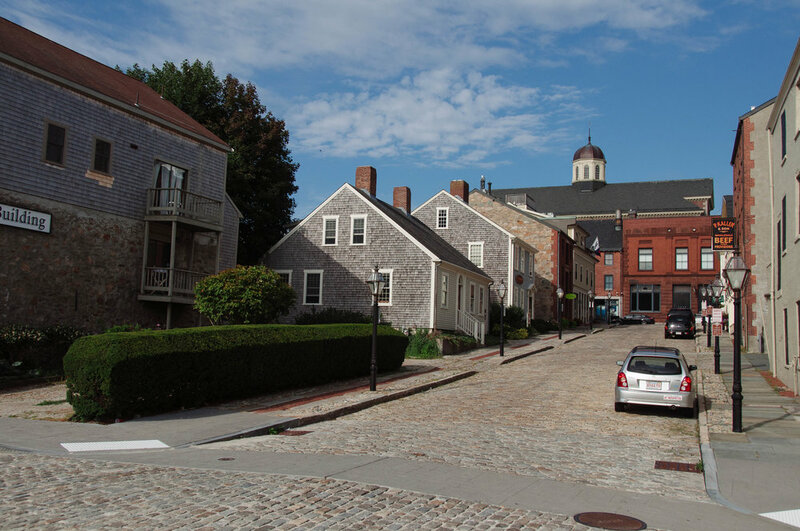 Throughout its streets, you'll find old brick buildings that preserve the legacy of the historic whaling city's architecture and house their stories from a time long ago. The downtown is not only beautiful, but very walkable. artifacts and exhibits, and marvel at its impressive collection of whale bones hanging high from its rafters. Galleries and artists are also plentiful here, and none are as notable as local artist Arthur Moniz, whose downtown shop is housed with original works that have captured the true essence of this charming coastline for over 35 years, and is most definitely worthy of a leisurely browse. When heading out of town, visitors can get one last food fix with a stop at Sid Wainer & Son, a produce and specialty foods retailer with a small gourmet outlet that has become a mecca for food lovers of all kinds. From exotic fruits to every kind of micro greens imaginable, you're sure to discover something new and interesting here. Antique lovers fear not, New Bedford has you covered here too. Acushnet River Antiques is just the down the road from the waterfront and boasts over 18,000 square feet of hidden treasures, nautical and otherwise. While the city has endured it's fair share of economic hardships in years past, it's now enjoying a thriving resurgence, and hopes to soon become the destination it truly envisions for itself.